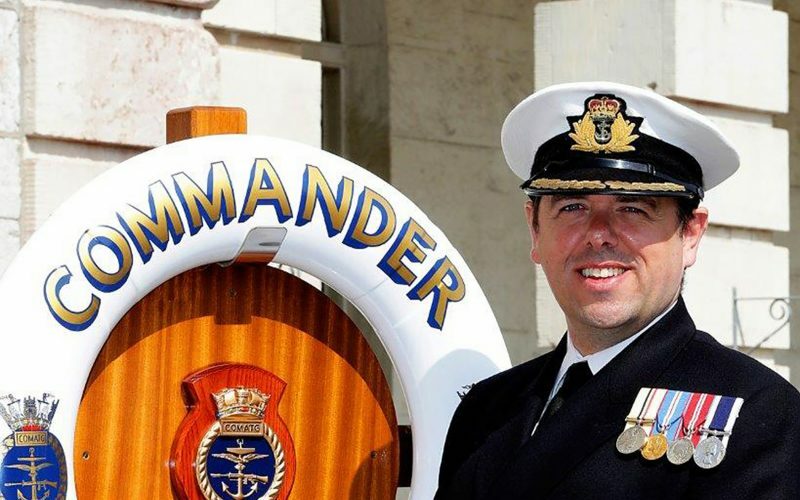 Commodore James Parkin, the current boss of the UK’s Amphibious Task Group. Photo: Royal Navy. With the Royal Navy making a significant deployment East of Suez for the latest Saif Sareea (Swift Sword) exercise at the end of 2018, WARSHIPS IFR Editor Iain Ballantyne conducted a wide-ranging, in-depth interview with Commodore James Parkin, Commander UK Amphibious Task Group (COMATG). They discussed key challenges confronting the British fleet today, including the enduring relevance of the UK’s amphibious warfare capability and the new concept of Littoral Strike. Here is a compressed version for interview, the full variant of which was published in the January 2019 edition. Bearing in mind the announcement this month (Jan) by UK Secretary of State for Defence Gavin Williamson of a move to create two new Littoral Strike Ships (LSS), clearly that forthcoming development was on the Cdre’s mind as he talked to this magazine’s editor. With the UK Secretary of State for Defence talking up the Russian threat in waters closer to the UK – promising to raise the British military’s game in the High North via deploying more commandos there – and Britain’s commitment to patrolling the South China Sea to secure freedom of navigation, what was the aim of Saif Sareea, from a maritime point of view? 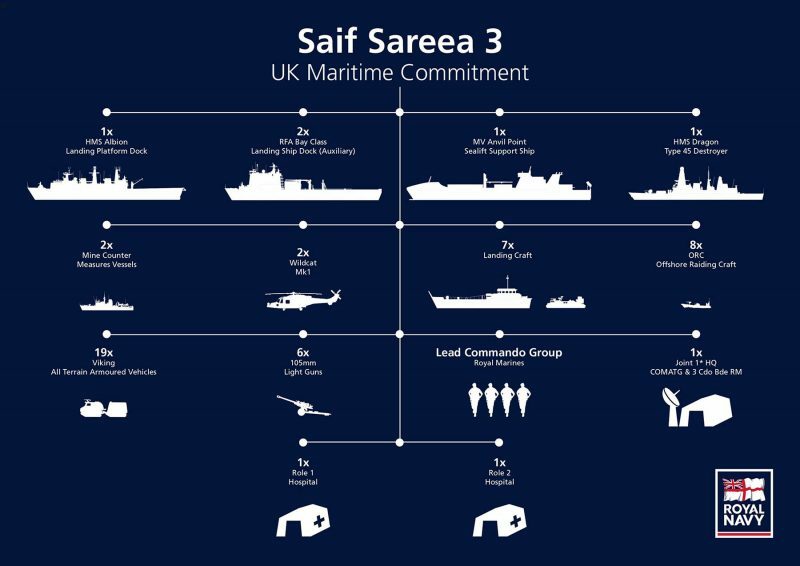 Saif Sareea 3 was specifically designed to practise working with our Omani friends; the tactics, operating procedures, and strategic thinking was focussed on the UK – Omani partnership at sea. 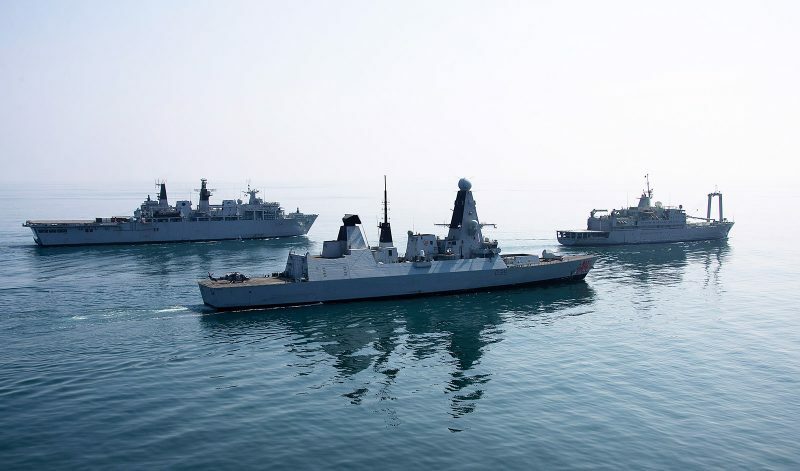 Our two navies have always worked incredibly closely together, so the overall aim was to increase our interoperability and strengthen relationships at every level, not least because Omani ports are among our most frequent ports of call. There are numerous transferable skills between what we did as a Task Group in Saif Sareea 3 and what we could do elsewhere in the world. Being part of an 18 ship combined UK-Omani group forced us to learn lots of lessons, but what we were primarily doing was practising our trade in very hot, very austere environments, rather than trying to draw parallels with operations we could be doing elsewhere. The exercise Saif Sareea 3 UK-Omani naval task group formed up off Arabia. Photo: Royal Navy. In the past the overall idea for the Royal Navy was that it would project power via both an ATG and a Carrier Strike Group, the former centred on one of the new carriers – presumably HMS Prince of Wales – in a few years’ time? Is that double track approach still a likely future? With Prince of Wales, in the role previously performed by HMS Ocean, an LPD plus LSD (A)’s operating as the ATG alongside the CSG, spearheaded by HMS Queen Elizabeth herself, with her F-35B strike wing? The Strategic Defence and Security Review 2015 talked about deploying: ‘A maritime task group centred on a Queen Elizabeth Class aircraft carrier with F-35 Lightning combat aircraft’, which absolutely remains our headmark, as a Navy, and as a nation. In the same week that an F-35B landed on Queen Elizabeth, US Marine Corps F-35Bs from the USS Essex Expeditionary Strike Group conducted live operations from the Indian Ocean into Afghanistan, showing for the first time the strike potential of these amazing jets. “Similarly, it would not have escaped your attention that the UK Secretary of State for Defence has reaffirmed the future of the LPDs, which remain the UK’s premier Command and Control, C2, platform. HMS Prince of Wales is, meanwhile, making tremendous progress in her harbour trials programme. At the same time, the Royal Marines – as they evolve into the Future Commando Force – are investing in cutting edge technology and new tactics, ensuring they remain at the very top tier of specialised forces. We are indeed still intending that our maritime expeditionary capability is based on that double track approach – what we are now calling Carrier Strike and Littoral Strike – giving options to HM Government that range from humanitarian assistance all the way to warfighting at scale. For my job, and my team, the potential of combining 5th Generation strike jets with ‘5th Generation Commandos’ is a truly exciting prospect, and I am engaged with colleagues across Defence, and with key allies, to help make this a reality. The CGI realisation of the proposed Littoral Strike Ship, which will be a hub for operations for the Special Boat Service and Royal Marines, plus other elite units. Image: UK MoD. What are the chances of Albion and Bulwark both being in operational service at the same time, potentially enabling a LPD to work with the Royal Marines in the Norwegian fjords on the NATO northern flank while the other is active East of Suez? Or is that scale of effort simply not possible for the UK anymore? The doctrinal answer to that question would be that future threats to UK national security will be difficult to predict and often unconstrained by geography. So, the way we should be thinking is less about platforms and more to do with effect. For example, where do we need to provide reassurance through presence, and where should we seek to cause uncertainty through unpredictability? But clearly the defence and security of Norway is of key interest to NATO, and an area where the Future Commando Force will excel, while my activity at the moment indicates that we retain a strategic national interest in the Middle East and Indo-Pacific, and will do for many years to come. I recognise the premise in your question, and it certainly would make sense to distribute our forces in a way that offers maximum flexibility, with the ability to ‘snap-back’ rapidly and re-aggregate for war-fighting. This is likely to involve a persistent presence in certain regions, and a more agile approach that allows us to surge into others. Does this involve running both LPDs? Right now, we have no plans to do so, and since the rotational model was put in place by SDSR10, we have sustained all our mandated outputs, and met all contingent activation, with just the one running LPD. But HMS Bulwark is being kept significantly ‘warmer’ in her low readiness period than HMS Albion was, with on-going maintenance and upgrades enacted, and engine tests – including turning the shafts – and full system checks every few weeks. She does need a refit though, so come back to me in 2022 and ask the question again! Bearing in mind the tenor of some of the recent debate in the media, some of it not entirely accurate – with amphibious warfare vessels depicted as being outmoded as nobody does D-Day style beach assaults – do you find it hard to convey to those beyond the amphibious warfare world the sheer utility across various missions of vessels like Albion and Lyme Bay? I share your frustration – nobody uses ‘A Bridge Too Far’ to benchmark air assault capabilities, or ‘Dambusters’ when discussing RAF strike operations in Syria, but lazy commentators quite easily lapse into the ‘Saving Private Ryan’ trope when thinking about what amphibious vessels do. This completely misses the point of our capabilities. Can we deliver troops onto a beach? Of course we can, but why would we, if we have an air group of Merlin helicopters and Chinooks dropping Commandos 100 miles inland? At the same time raiding parties delivered by hovercraft can scale cliffs to take enemy installations that have been rendered defenceless via a cyber attack launched by seaborne information warriors, and F-35Bs have air superiority overhead. Amphibious ships have huge utility – they can be used for Humanitarian Assistance and Disaster Relief, become floating safe spaces for refugees or UK nationals in distress. Ultimately they are a base for sovereign UK operations that can go anywhere in the world. As Commander of the Amphibious Task Group I can deliver 1,800 Royal Marine and Army Commandos of the Lead Commando Group, sustain them ashore and recover them to sea, all without asking the permission of any other nation and without establishing any permanent presence. The Secretary of State for Defence recognised the value of the LPDs when he announced he was personally safeguarding their future. He absolutely gets their utility and I believe that the rest of UK Government does too. There’s been a fair bit of talk recently about Devonport becoming a centre of Anti-submarine Warfare excellence with the future base porting of the new Type 26 warships there. Is there still a healthy future for Devonport as ‘centre of amphibious warfare excellence’? Yes, although it isn’t often appreciated that ‘Centre of Excellence’ is a NATO term, quite carefully defined. I think there are 24 of them around the Alliance, covering a wide array of warfare disciplines and military specialisations. For example, we work closely with the snappily titled ‘Combined Joint Operations from the Sea’ Centre of Excellence in Norfolk, Virginia on amphibious matters. The establishment of the RN’s Anti-submarine Warfare Centre of Excellence is therefore aligned with that experience. It more reflects the intended concentration of ASW expertise in the South West of England, as towed array Type 23s, and the Type 26, become base-ported in Devonport, close to the Merlin HM Mk2 helicopters of RNAS Culdrose in Cornwall. In terms of the Royal Navy and Royal Marines units that deliver littoral strike, I am not aware of any plan to set up a dedicated Centre of Excellence, but there is no doubt that the South West will always be the spiritual and actual home of most of the ships and Commando units that fall under the operational command of Commander of 3 Commando Brigade and myself. There are some decisions to be made about the exact future basing of certain RM and RN amphibious units – including COMATG HQ – but, with the notable exception of 45 Commando, the RM Viking Squadron, and the two aircraft carriers, you will certainly find amphibious excellence centred around Devon, Cornwall, and Somerset for decades to come. The British amphibious units committed to Saif Sareea 3. Image: Royal Navy. What’s next for yourself and the COMATG team? I think 2019 looks to be incredibly demanding, and not just as my entire staff remain at Very High Readiness for contingency operations. Saif Sareea 3 finished in November, so although we have returned to the UK, we remain focussed on crisis hot spots around the globe, anticipating where HM Government might require us to work up options for responding at short notice. Perhaps most excitingly, in a key milestone for my headquarters, in January 2019 I will become the Commander Amphibious Task Force for the NATO Initial Follow-on Forces Group. This role will involve a busy period of integration training, including large-scale exercises in the UK and other areas of North West Europe, before we embark on a major maritime deployment alongside all our partner nations from the multinational Joint Expeditionary Force. At the same time, we will also be developing our concept of Littoral Strike, building and maintaining our relationships with counterparts in the Netherlands, USA, France, Australia, Italy and elsewhere, while contributing towards wider Defence thinking in the UK’s Modernising Defence Programme. It’s going to be a busy year for my small team, but it should be incredibly rewarding.